For you to be able to pick the perfect safari country for you, you need to know the wildlife you would want to explore. Is there a particular animal or event you wish to see? 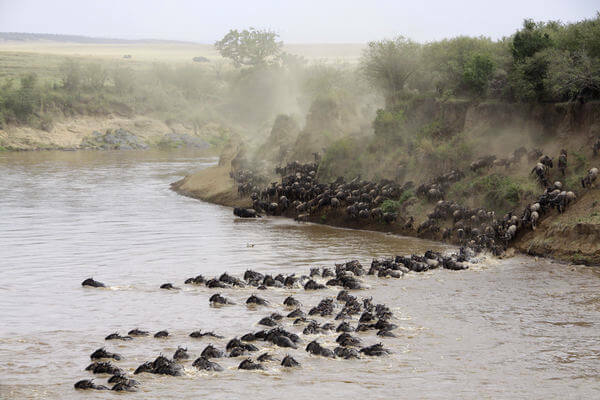 If you are hankering to witness the Great Migration, Kenya and Tanzania around July to October are your best bet. For massive herds of African elephants all year round, go to South Africa or to Botswana. The “Big Five” are also very abundant around East Africa and most countries in Southern Africa. For gorilla trekking, head on to Uganda, Rwanda and the Congo, all of which you can find in Central Africa. Uganda is also the best place to find chimpanzees, if that interests you. How early to book your trip? Some would say that booking it a year early is most ideal. Truth of the matter is, your booking can be from a month to a year (or even more, for some) depending on the number of travelers, size of the lodge/camp and time of the year you plan to go. If you are going solo or as a couple – probably for an anniversary or a honeymoon – booking a year early is not really necessary. One month or even a few weeks lead-time is usually enough UNLESS you have your eyes fixed on a certain location, lodge and dates, and you regard these specifics as non-negotiable. Also, you have to note that the more time you have to prepare, the more prepared you’ll be in leveling expectations. However, there is also a downside to booking very early. A year is long and we really don’t know what will happen within that span of time. But then again, if you are determined to avoid unnecessary disappointments and you already have your heart set on a certain date, event or lodge, book it A.S.A.P. If you are going as a group, booking as early as possible is wise because you may need a number of rooms. Safari lodges/camps have a limit to how many people they can cater. For example, a luxury safari camp can only accommodate around 20 people. This is also the reason why the size of the lodge or camp matters in how far in advance you need to book. Another important detail you need to consider is the date of your visit. During peak seasons, you’ll be surprised how most accommodation are already at capacity about a year in advance. Every traveler or group of travelers naturally have different wants and needs. Are you traveling with kids? How about seniors? Most people who travel with kids or seniors would want to have less layovers as possible. So, make sure to check the travel routes available in your country of departure and have a list of your backup airlines, just in case. Also, younger kids and older adults might not want to go on a long safari drive. Tell your operator about this and they might arrange a special activity for them or maybe even delight them in a short safari drive. Child minders, or babysitters as popularly known in most countries, are also available upon request. Another thing you might want to think about is diet. Do you have any special dietary restrictions? Perhaps a gluten-free or vegan diet? If so, you need to specify these with your travel operator. Another vital detail in planning is WHEN you intend to visit Africa. At what time of the year do you plan to go? Does it fall on a low, mid or high season? Basically, countries get more crowded, prices get steeper and safaris get fully-booked faster during peak season. This is opposite during low season. Cheaper prices, less tourists and a relatively higher chance of booking your desired safari accommodation/tour/activity even with minimal lead time. You have to consider, however, the animals you want to see and activities you want to do. If you are aiming to see certain animals or witness a particular event, like the Great Migration around July to October, you also need to familiarize yourself with the seasons of your target country and the perfect time to see them. Game viewing is best during the drier and hotter seasons, although it is generally good in most parts of Africa all-year round. For birding, it is known to be better during wetter months when nesting and breeding takes place, and most migrant birds inhabit the area. As there is a long and varied list of activities you can do, you should also take into account those that you wish to experience and of course the purpose of your travel. Are you on a honeymoon or a romantic getaway? If so, what activities do you want to add? Perhaps a romantic candlelight dinner by the bush or maybe a hot air balloon ride? Are you traveling with kids or elderlies? Because let’s face it, tagging kids along is a game changer. Also, elders aren’t so much inclined to long drives and an adventure-packed itinerary like younger travelers. How many days do you want to spend on a safari? You see, all of these should be considered. Some activities may not be available in some countries. Like if you want to go to the beach after a week in the safari, some areas in Africa doesn’t have beaches. Some activities may not be as enjoyable for particular age groups. Although fairly flexible, each camp and safari tour has age restrictions. Some lodges and safaris don’t even accommodate children below 6, and have limitations for visitors aged 6-12. A number of them also offer child minders aka babysitters for an additional cost. Some activities may not be gratifying or maybe even plausible during a particular time of the year. During heavy rains, many animals disperse and vegetation is lush thereby increasing the chance of an obstructed game viewing. Some roads can also become impassable or extremely muddy so gorilla trekking could be difficult, game drives limited and you wouldn’t possibly want a walking safari by then. Some lodges and camps could be closed, too. That’s why if you come around these months, you have to make sure your desired accommodation is open and available. Another issue to rainy season is that excellent photo opportunities are rare. Setting a budget is not an easy task unless you have a gazillion extra dollars in the bank. So if you want to maximize your African experience and at the same time stay on budget, you need to set how much you are willing to spend for the safari alone. Flight costs aren’t inclusive so you also have to consider this one. Of course, fares vary depending on your place of departure and dates of travel. You can check the airlines ahead for an idea or if you’re lucky, you might even score a good deal. A typical safari covers 7 days and is usually all-inclusive for meals and accommodation, except the last day of stay. Prices can go as low as 120USD a day during low season and as high as 1000+USD a day during high season. Based on your budget, you will find a wide array of options that will suit your liking from budget to mid-range to luxury safari trips. Of course you can’t expect a shoestring budget to get you a luxurious one. But also, you can have enough money to afford a luxury level trip but not necessarily stay in luxury lodges. Instead, you might want to stay longer, visit more attractions or perhaps spend a day or two at the beach. Besides, all tour operators offer the same destinations and animals. After all, there is only one Maasai Mara, Serengeti, Etosha Park, etc. Right? Just note that national parks are a tad less expensive than private reserves. Travel enthusiasts claim to have saved about 25USD in national parks. Also, if you want to join a group, it will cost you less but not all countries offer group-joining safaris. Should I self-drive or book with a safari operator? To many, self-driving gives them a purer sense of adventure. While this is true when you travel most countries in the world, it could be quite different in Africa. More budget-friendly especially if you really know where to go. Also, driving from one place to another is significantly cheaper than flying. You can travel at your own pace so you can see more of what you really want to see and linger at places you want to stay longer. You can explore for yourself and really feel that sense of wanderlust. There are a lot of bumpy roads and closed roads you cannot access. You might find yourself driving back a couple of times, going around and trying to find your way. But then again, if this is your kind of adventure then why not? Most places in Africa is really remote. If your vehicle breaks down in the middle of nowhere and you are unprepared, and there’s no network…..
You can save a lot of time from traveling from one place to another and spend more time at parks, reserves and other attractions. In case something goes wrong with the vehicle, operators are well-prepared and equipped with tools. Plus, they know the areas very well so getting help would be a piece of cake. Besides, all their vehicles are very well-managed and maintained. Guides and drivers are long-time experts who could bring you to exactly where the big games are. They usually have access to road blocks, too. Otherwise, they are very knowledgable on all the road twists, turns and bumps. With a very experienced guide who is proficient in African history and culture, you will be able to learn more as you travel. Fun facts and background stories will be imparted in the most educational and entertaining ways. Your utmost comfort and convenience are always guaranteed. Snacks and beverages are provided as well. Time can be restrained with safari guided tours as you have an itinerary to follow. However, know that you always have a say when planning your entire trip beforehand. Safari operators are very adept to making tailor-made safaris. Relatively more costly compared to self-driving, especially because you need to tip the driver, guide and hotel staff. If you go with booking with an operator or guide to really see the best of African safaris, picking the right one can make all the difference to the quality of your trip. That’s why it is critical to know what to look for when choosing your safari operator from among the thousands available today. Airfares vary depending on where you are traveling from, when you are going to travel and if it is a direct flight or a connecting one. You may also want to consider your travel buddies. If you have kids in tow, you may not want to have a long layover. Also, if you are planning for a multi-country safari, you might want to check if flying to country A and out of country B is more economical than the other way around. Some travelers prefer booking early (as early as one year in advance). This gives them an advantage of securing seats and accommodation on their desired dates PLUS it also gives them a significantly higher chance of scoring lower rates on airfare and possibly on other things, too. So now that you have made your research, you are ready to book! When all is set, what’s next? • What to pack. Just like any other vacation, you need to pack your essentials. But since Africa is not just like any other destination, you might need to add or take out a few stuff in your list. • Medications. Prevention is always better than cure. And because a trip to Africa gives you a higher risk if contracting disease, you may need travel vaccines so make sure to check in reputable sites such as CDCP and WHO. • Visa. Visa requirements vary per country so check online or through their embassy in your country. • Travel safety. Not all countries in Africa require insurance but it’s best practice to always have one.